In 2017, there were approximately 450,000 daily bike trips in New York City. That is an increase from 170,000 daily bike trips in 2005. As of 2017, New York City had 1,333 miles of bike lanes, compared to 513 miles in 2016. There are Class I, Class II, and Class II bike lanes. Class I bike lanes are separated from vehicle and pedestrian paths. Class II bike lanes are marked with paint and signage and lie between a parking lane and traffic lane. Class III bike lanes are shared by both vehicles and bikes, marked by signage. The most heavily used Class I bike lane in the United States is the Hudson River Greenway. It is part of a 3,000-mile trail system that connects Maine to Florida! Central Park is one of the most beloved places to bike in New York City. 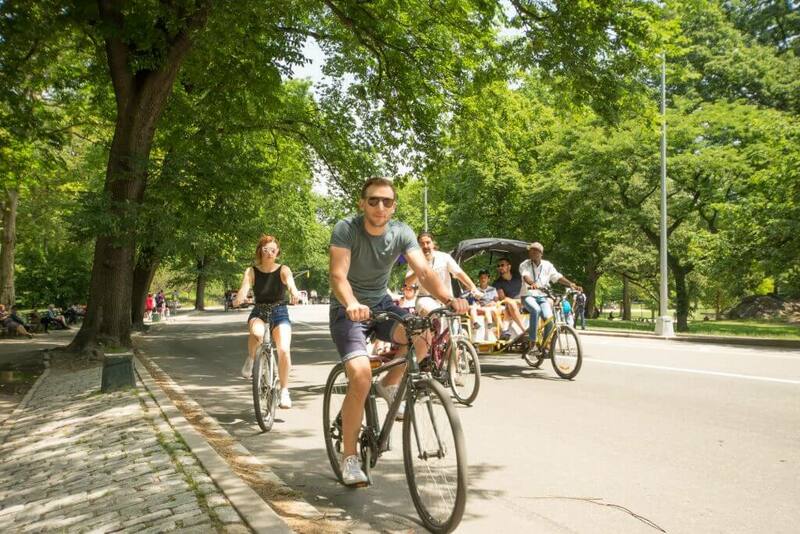 On a bike, you can experience a lot of the famous Central Park in a short amount of time and have plenty of opportunities for photos, food, sightseeing, culture, play, and relaxation. The park provides three long-distance routes to choose from – 6.1 miles, 5.2 miles, and 1.7 miles. According to the Smithsonian, Central Park is designed to be a microcosm of New York state: It features manicured, formal sections like the wealthier suburbs up north as well as tranquil, lush sections with benches and gazebos like the Catskills and the Adirondacks. The vast size and varied beauty make biking the perfect way to explore Central Park. Begin surrounded by forest and end enjoying the ocean breeze. You will ride the length of the Ocean Parkway Coastal Greenway, America’s first bike path (established in 1894). For challenge and excitement, check out the free-ride trail and speedway trail for bumps, drops, and inclines. Then, bike over to the lush, majestic sanctuary of Fort Tryon Park, the city’s largest public garden. This car-free oasis offers cycling, culture, play, and sports. It’s a dynamic venue for art installations and performances. Enjoy a waterfront view of the Statue of Liberty and lower Manhattan skyline. After crossing the Manhattan Bridge into downtown Brooklyn, explore along the waterfront into Williamsburg and over the Williamsburg Bridge back into Manhattan. Brooklyn is wonderful to explore by bike! City Island is a quiet fishing village that offers antique shops, Victorian mansions, 30 restaurants, a nautical museum, and bird-watching. This loop unites Jamaica Bay, Brooklyn, and Queens, offering plenty of opportunities for nature and culture excursions along the way. This ride offers bustling neighborhoods, playgrounds, meandering forest paths, art installations, stunning cityscapes, and more. On the quintessential NYC bike ride, you will see fields, flowers, wildlife, architecture, statues, and bodies of water. You can make a picnic outing out of it.